Recently, my in-laws drove up for the weekend of our son’s spectacular 8th birthday. Needless to say I was already a bit on edge planning for an epic party. It was a smashing success but I realized afterwards that I had made absolutely no plans for dinner (with our in-laws as guests). To be fair, all I really wanted was a nice glass of wine and a sandwich. After asking what they liked, my mother-in-law had the brilliant idea to stop at the store and just pick up some nibbles that everyone would like. 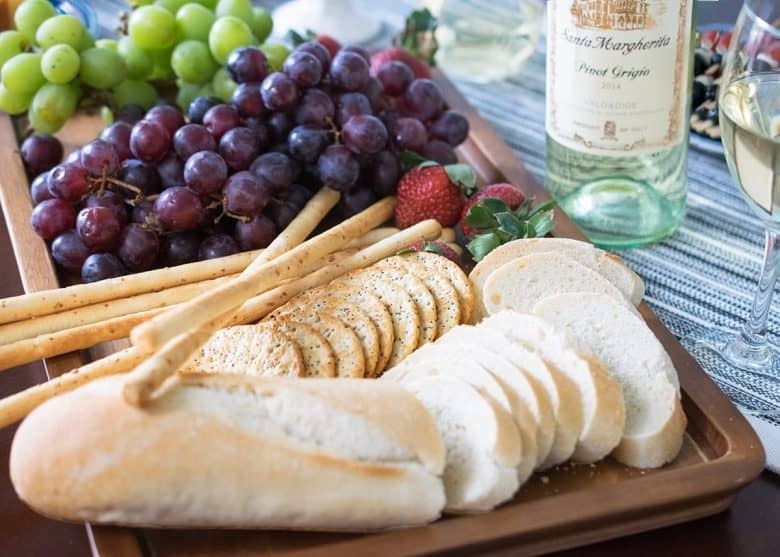 Hubby grilled some chicken sandwiches and we made this delectable spread for an relaxed and easy wine and cheese party! With a spread like this, I don’t think anyone could complain. There is something for everyone including meats, smoked cheeses, pasta, even chocolate! And the best part… I didn’t have to cook a thing! The spread turned out so pretty that I actually got motivated to take a few pictures. For the party, all you need is a quick run to the store for an array of fruits, breads, and deli meats as well as tasting chocolates. Of course, a good wine is a must as well. 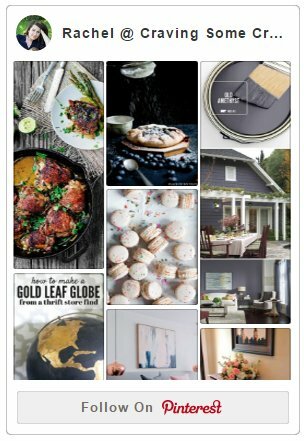 It’s versatile enough to enjoy at home while you unwind, as well as elegant enough to present at a Sunday brunch (to your mother-in-law who knows a thing or two about wine). Pick a quality wine that is well balanced, light, and crisp. 2. Friends and/or Family. What I love about this style of party is how laid back it is. You could add an activity if you wish, but this is the opposite of my often over-the-top craft parties. Good conversation with loved ones is all you need. 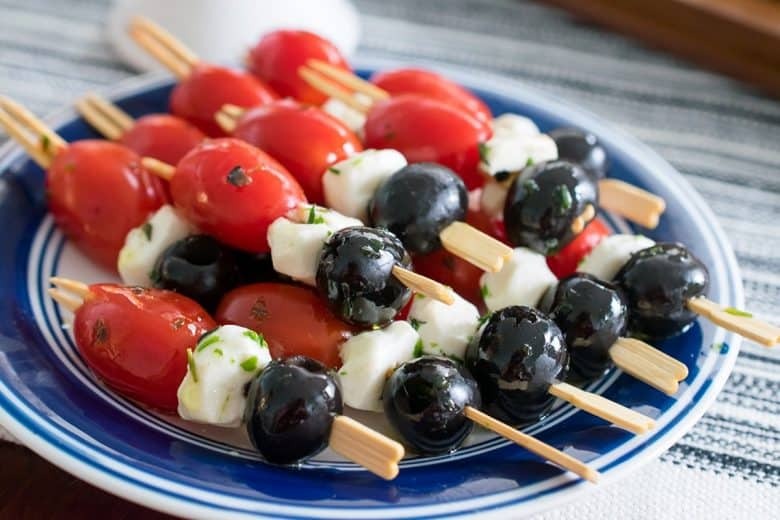 I tossed together quick antipasto skewers consisting of olives, mozzarella cheese, and grape tomatoes. Whisk together a few teaspoons of your favorite spice blends (I used garlic, pepper, basil, and parsley) into 1/4 cup of olive oil. Drizzle over the top. Delicious! Is this not the best way to spend a cozy evening? !